A clear, calm, sunny morning is a gift wherever you are, but especially in Wellington, emphasis on the ‘calm’. This was a to be bit of a theme on my second activity today, an e-bike ride around the harbour to Miramar, but first I went to Parliament. I've done the Parliament Tour before, but a while ago, so I needed a refresher for my story, and it was interesting - firstly, that I was the only Kiwi in the group, which apparently is the norm. Astonishing. We trailed along the literal corridors of power, past the old iron liftshaft that's the backdrop to all the news interviews with the politicians, into the library, debating chamber, committee rooms, hearing history, looking at statues (Kate Sheppard the first) and portraits, works of art and the building's clever anti-earthquake base isolators. It was all very neat and, today, since it's not sitting, deserted. We weren't allowed to take photos, but afterwards, wandering back out by myself after a coffee in the Parliamentary café, there was no-one around, so I did. I headed back to the waterfront via the National Library for a dutiful look at the Treaty(s) of Waitangi, the Declaration of Independence and the huge rolled-up Suffrage Petition - 1893, we were first to give women the vote, you know; and a quick circuit of Old St Paul's where they are certainly very forward in their expectation of a donation. Next was my Switched On Bike Tour in the company of guide Jimmy. I am already a fan of e-bikes (it only takes one ride to convert you) but these bikes were even better than my first experience, being a bit less heavy and clunky, but amply powered for today’s 25km ride which was mostly on the flat. We skimmed off along the wide pedestrian waterfront, which is continuously busy with walkers, joggers, bikers, skateboarders and dog-walkers – so there was a bit of weaving in and out, which added to the fun. We stopped to admire the Kupe statue – he discovered New Zealand, about 1000 years ago, a very impressive achievement of navigation, but it was his wife who first saw land and gave it the name of Aotearoa. (There was a bit of a flurry recently about using that as our official name, but it faded away almost immediately.) We also stopped to admire Solace in the Wind, which I had always thought, without knowing its name, was a statue of a man about to dive. But he's braced against the wind that Wellingtonians automatically deny (sorry about that ill-placed reflection). We cruised along the cycleway past marinas, pretty boatsheds, Oriental Bay with its lovely artificial beach of golden sand (imported originally from Golden Bay in the South Island), rows of cute wooden two-storey villas interspersed with private cable-car rails shooting remarkably steeply up the cliff, and fetched up at the Zephyrometer – a similar but different wind-powered kinetic artwork from New Plymouth’s Wind Wand, and onto its second incarnation because it’s built to swivel and, this being Wellington (average wind speed 27km/h, highest recorded 250km/h during the Wahine storm in 1968) its tip has occasionally bent a bit too low for the peace of mind of passing traffic. We continued past the end of the airport runway, past the wind-swept Hollywood sign rip-off, and turned off along the edge of the Miramar peninsula towards Shelly Bay. New territory for me, and what a revelation! So close to the city, humming away across the harbour, but cicada-buzzing bush on one side of the narrow road, and little beaches on the other, where fabulously clear, blue water was lapping on the sand. 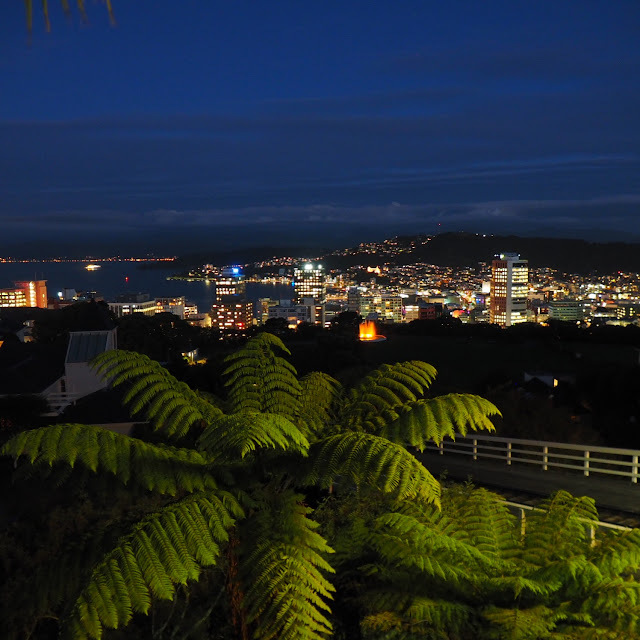 It was a whole other side to Wellington for me, and not just geographically. We skimmed along to the Chocolate Fish Café, in its picturesquely peeling old navy/air force building, had a nice smoothie and a chat in the sunshine, and then headed back along the road again. At the end of the peninsula, we headed up the hill towards a lookout on the headland, and here was another revelation: the road was quite steep, but I cycled up it sitting up straight! Clicking on up to Turbo setting meant that I just kept pedalling at the same easy rate, but got enough of a boost from the motor to flatten that angle out completely. Fabulous. And all completely silent, of course. We looked out over Wellington’s lovely harbour, noted that the planes taking off and landing had changed direction because of the wind, I listened to a Maori legend/geography explanation that was as inventive as always, and then headed back to the city. It was just after 5pm by now, and the commuters were heading home, Wellington-style – that is, walking and cycling along the waterfront (more ducking and diving required), and queuing patiently for ferries. We got back after almost three hours, that had zipped by as effortlessly as if on an e-bike. Brilliant invention! We ate very well at the Thistle Inn in Thorndon, in the very building patronised by both Katherine Mansfield and Te Rauparaha, if you could ever think of a more unlikely pairing (though it wasn't of course) where young barman Matt was a star with clearly much more ahead in his future than advising customers to choose the venison risotto (though I did, and it was delicious). We finished the night with a trip in the cable car up to the top for a splendid view over the city on this beautifully warm, calm night, with the city looking exactly as lovely and interesting as it actually is.